Dream House is a brand new art installation commissioned especially for the Small Stories exhibition. Twenty contemporary designers from different backgrounds are making miniature rooms, which will come together to create a fantastical dolls' house structure, showing many different ideas and points of view. For Dream House, designers have been asked to think about their own desirable rooms - aspirational, fantastical, whimsical, technological, practical or historical. The designers have diverse backgrounds, making things from greetings cards to jumbo jets, so the results are sure to be fascinating. As the finale of the exhibition, Dream House will bring the Small Stories up to date and reflect on the idea of an ideal or fantasy home for 2015. "The Dream House room Orly Orbach has created centres on a small sleeping figure, surrounded by haunting images of animals and humans. Developing her idea for the room, Orly played with the idea of dreams opening up different spaces, physically and psychologically. Thinking about Jung’s use of visual symbols, she sketched ideas for rooms that frayed and dissolved, opening into dream spaces. 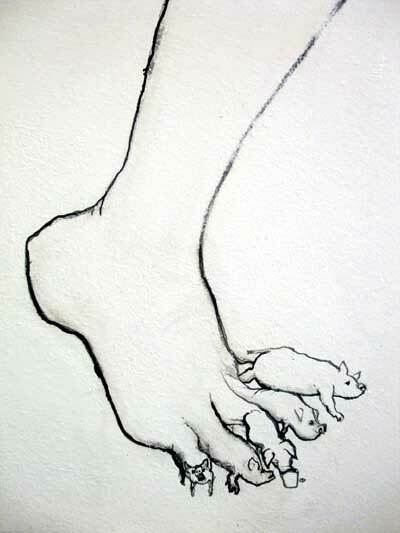 The idea of a cave with drawings of animals flickering around the walls also fed into the final form." A creative response to the Sheldon Tapestry, Market Hall Museum, Warwick,2015. Inspired by the Sheldon Tapestry, Orly Orbach and members of the CiCC set out to make a modern-day map of Warwickshire, populating it with personal stories of place. The philosopher Casey refers to place as a mode of containment with a capacity to gather experiences, histories, languages and thoughts. He describes places as events, in which person and site activate one other. So rather than thinking of places as static, we considered places as meeting points between a person and a landscape. The artwork shows how we relate to places around Warwickshire, what makes them special to us, and what connects us to them. Orly Orbach worked alongside the young people through ten workshops, at times working freely, at times responding to set tasks and themed questions. The stories were mapped using prints and drawings, quotes and transcribed conversations to show how places are made meaningful through our interaction with them. 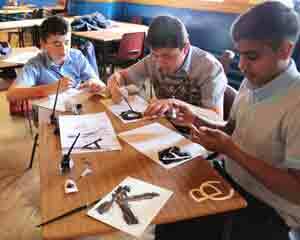 The group created stamps, linocut prints, observational and imaginative drawings and typographic pieces. The workshops provided the young people with a space to create and express themselves, working with new image making techniques and ideas. Orly Orbach illustrated some of their stories, and recorded and transcribed conversations. The group edited the content, a process that allowed them to reflect on their thoughts, beliefs and interactions. 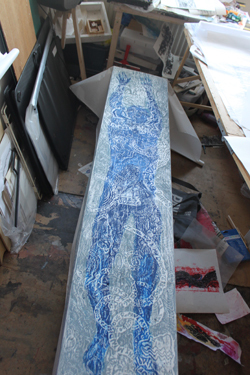 The pictures were then scanned, rescaled and digitally reprinted on fabric. 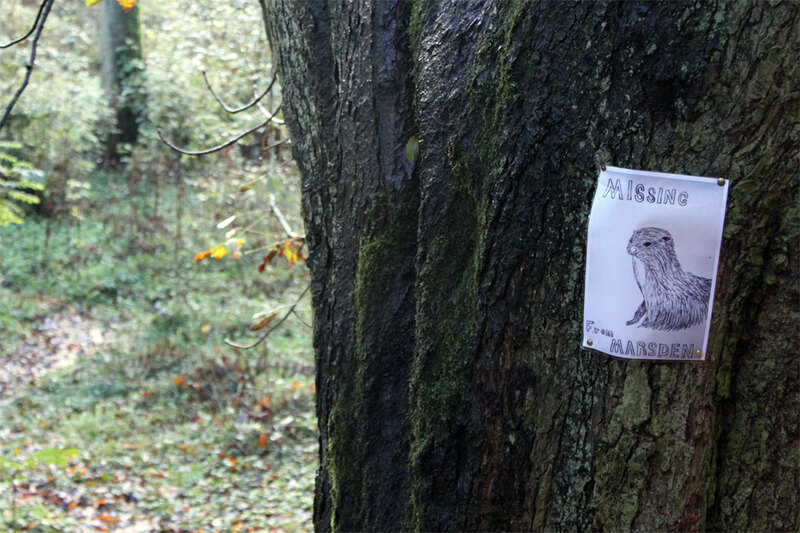 The artwork contains different narrative threads, showing the connections and ties to the landscape illustrated by young people through words and imagery. The result is a collaborative piece that externalises the subjective experiences of space. The artwork is presented as curtains. Its title, ‘The View from My Bedroom Window’, comes from a drawing made by one of the young people during the first session. The group were asked to draw maps of where they live, and this particular drawing showed a vivid, personal and direct observation of place. The map of Warwickshire was turned into a recurring motif, spray-painted and turned into a repeat pattern. The spray-paint map motif came from a CiCC member, who drew several versions of a hand squeezing a spray-can, painting the Warwickshire sign on a brick wall. As well as a symbol for a youth perspective, the spray-painted map makes us question the accuracy of cartography, whether maps can ever be a true and fixed representation of space, and how borders are largely a human construct. As another CiCC member observed, the borders at the bottom right corner of the Sheldon Tapestry map are blurred. Likewise, the spray-can map motif has blurred borders, reflecting many of our experiences of living between places, moving across the county, and having our sense of place not so clearly and neatly defined. This artwork was created by the Warwickshire Children in Care Council (CiCC), together with artist Orly Orbach. The project was developed and managed by the County Arts Service, in partnership with Shinderpaul Bhangal (Practice Leader, Children's Participation), Warwickshire Children and Voluntary Youth Services and Warwick District Council. CiCC is an elected body of children and young people in care. They meet regularly in order to help Warwickshire County Council make being in care better for them and other children and young people. CiCC is a way for children and young people to get their ideas across to those who run children's care services in their local area. The group have an insight into Warwickshire, and the artwork conveys their perspective. The artistic vision for this strand of the Reframing Sheldon project was developed and designed by artist Orly Orbach, as a way of creating a visual ethnographic artwork through a collaborative process. Ethnography is the recording and analysis of a group of people, place or institution. Traditionally ethnographies are written about a group of people by an anthropologist, but Orly wanted to co-create an ethnography together with CiCC members, and use creative and visual ways of recording their perceptions of place. This project explores methods of co-writing ethnographies with source communities, involving them in the process of documenting and making representations of contemporary social life. 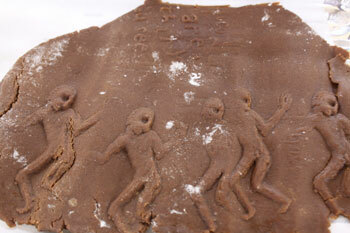 The Library of Untold Stories is a collaborative public sculpture made through a series of workshops with Waltham Forest residents, who created clay book covers which were cast in plaster. The result is a series of fossil-like remnants of book covers, with diverse titles ranging from Sci-Fi and detective novels to music, children's books and sacred texts. These semi-biographical works give an insight into the experiences, passions, beliefs and fantasies of local residents. Through this intervention, library users become authors of these unpublished and unfinished novels or 'phantom books'. The work references the Library of Ashurbanipal, the oldest surviving royal library in the world., where thousands of clay tablets and fragments were found. The work was displayed at Leytonstone Library where it is currently stored. 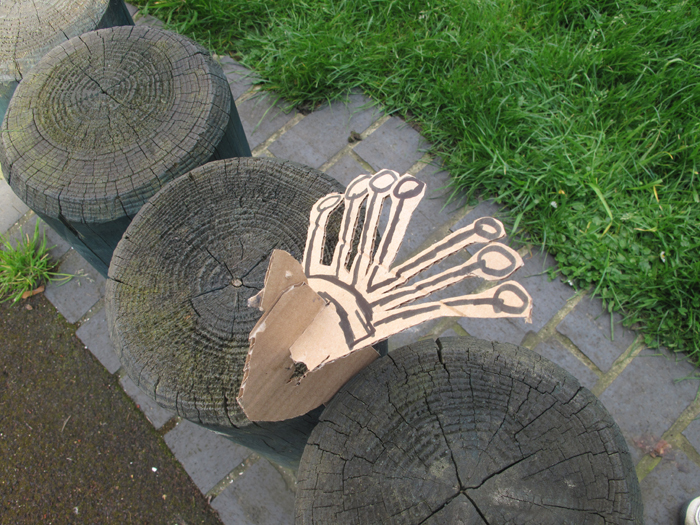 A bench commemorating the year 2012, made with Barking and Dagenham residents. memories can be recollected ad stories can be reproduced. The bench was created by different members of the community, including children, adults, volunteers, the Mayor and Sebastian Coe. 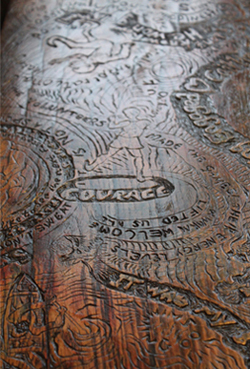 The handwritten inscriptions were engraved into the bench's surface, making the text looks as though it seeped into the wood. Members of the public can make rubbings using crayons or pencils on paper, making the bench function as a public printing plate and open book.. 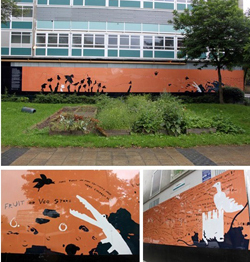 Commissioned by Barking Council as part of Molten Festival, created and installed at Barking Learning Centre. Artwork for a new school building in Bilston, commissioned by Project Dandelion. The wall piece references the history of the Black Country and celebrated local dialect. Made through a collaborative engagement process with the English department, staff and students. Using stencils and handcut letterstamps, studnets made language visual and physical. Artwork installed in September 2012. 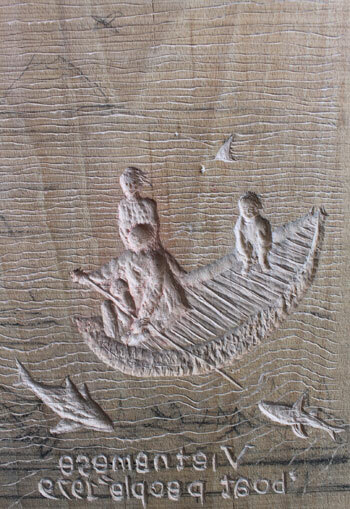 Pyrographic printing plates for Charleston House, used by visitors as a trail around the house and garden. Pyrographic printing plates for Camden Arts Centre, used by gallery visitors to create picture-poems. Pyrographic printing plates for the Bronte Parsonage Museum, inspired by Charlotte Bronte's early work. 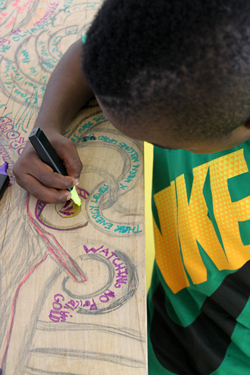 An interactive story bench for Paignton Library, commissioned by Torbay Council. 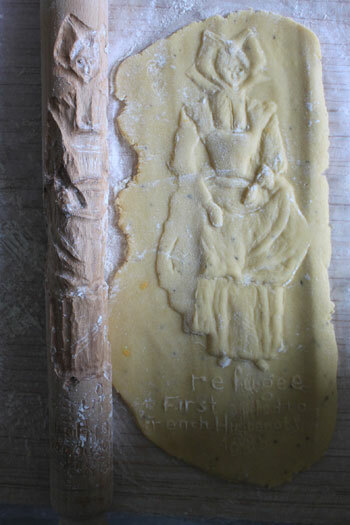 Stories and memories were collected by local artist Kate Green, and inscribed by me onto the bench's surface. .
Handcarved wooden biscuits moulds that form an open book which participants use to make edible gingerbread pages. 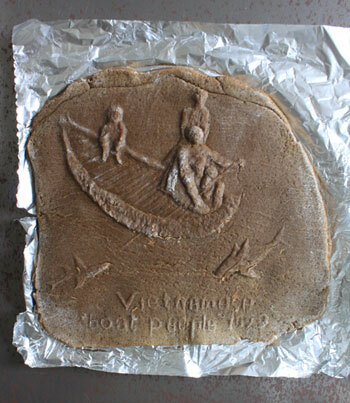 The biscuits tell a history of British refugees dating back to the 16th century, based on archives from the document 'The Heritage and Contributions of Refugees to the UK – a Credit to the Nation. 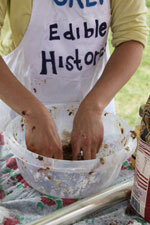 This participatory art event was set up during Refugee Week 2013 at the South Bank. 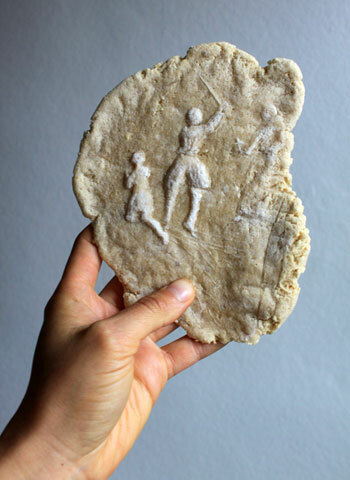 Members of the public mixed the dough and used the wooden moulds to made their own casts, creating miniature reliefs of historical scenes to take home and eat. 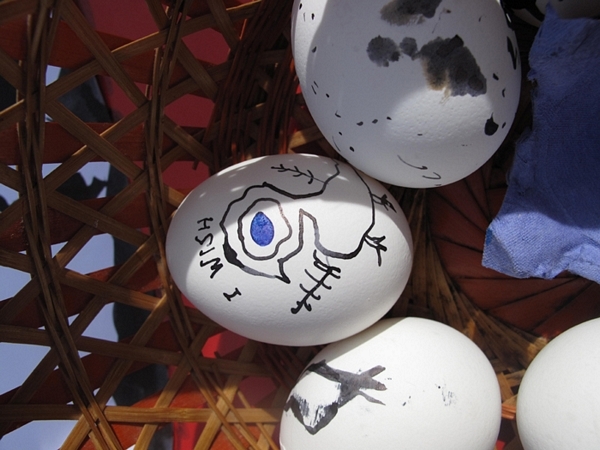 The project was run as a free participatory art event, bringing art into the public realm and challenging how stories can be produced, discovered and shared. transcultural issues of identity and representation, the project also questioned how information is 'consumed', and physically highlighted the ephemeral nature of stories and histories, presenting archives in their fragmentary state. 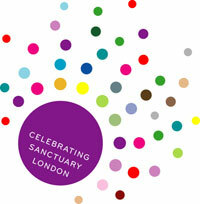 Part of Celebrating Sanctuary London. Commissioned by Simple Acts for Refugee Week UK. The project continues as a school workshop. Sponsored by G.R. Wright & Sons Ltd. 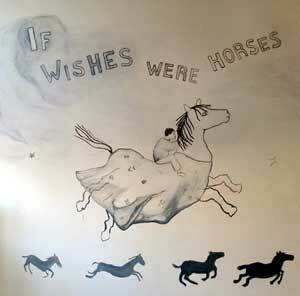 If Wishes Were Birds - Wall drawing created with residents of Sceaux Gardens estate. Initially intended as a visual metaphor that linked the seperate blocks around the estate, the wishing wall idea was developed during a six-month residency that forms part of the South London Gallery Making Play programme. 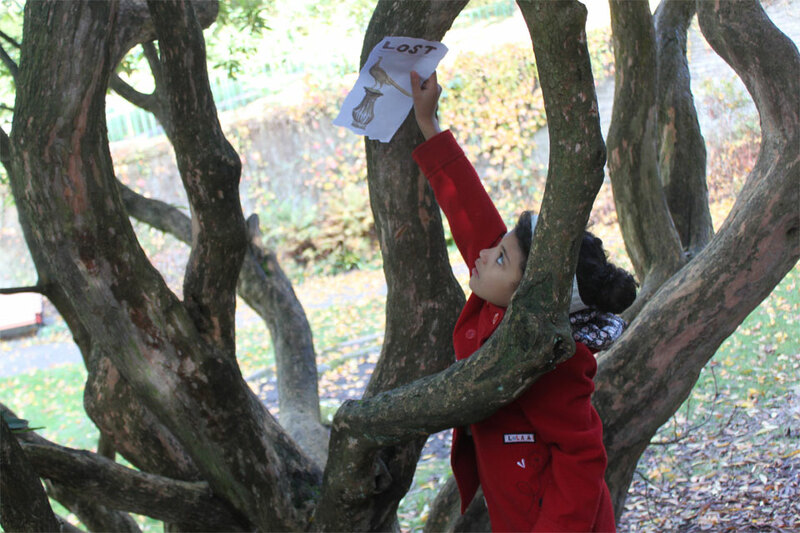 During this residency I tested collaborative methods of creating narratives with local children and families around the estate. I was interested in using fiction as play, exploring how stories can be used as meeting places and a way of bringing the community together. The wishing wall aimed to open paths of communication, allowing people to express their thoughts and feelings about their neighbourhood and the changes that are taking place. The creative process of building a wishing wall was aimed to provide a positive shared experience for the community. 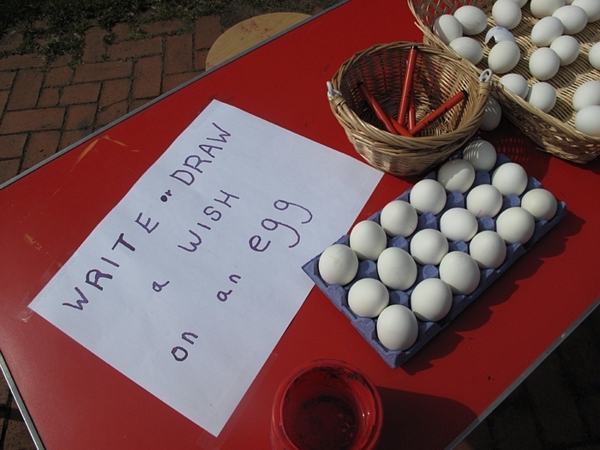 Making the wishes visible was a way of allowing further dialogues to emerge. This artwork for the mural was made with the children of Sceaux Gardens, who created their own shadow-puppets characters and storyline. Their puppets were turned into graphics for the mural by designer Johanna Brinton. 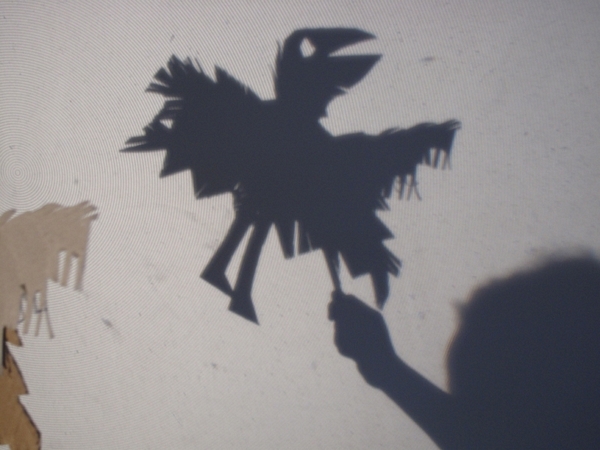 Bird shadow-puppet used for the final artwork. Cardboard Wishing Bird made during the workshop. An interfaith art intervention in Brick Lane. A site-specific, interpretive artwork in response to the William Hogarth exhibition Industry and Idleness, made in collaboration with Museums Sheffield Youth Forum (-see workshops and residencies page). 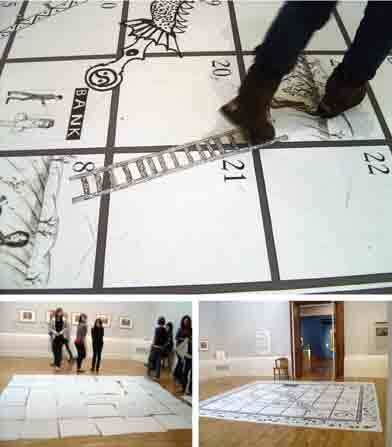 The final artwork is a snakes-and-ladders floor vinyl that combines drawings, motifs, sequential comic-strips and a mutli-choice questionairre made by different members of the Youth Forum, forming a polyphonic visual piece that brings focus illuminates themes in William Hogarth's work and invites viewers to play in the gallery space and interact with the artwork.. March- May 2009, Graves Gallery, Museums Sheffield. 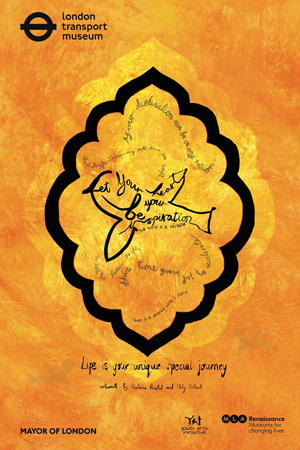 Created collaboratively with young people from the Ismaili Centre, commissioned by the London Transport Museum. 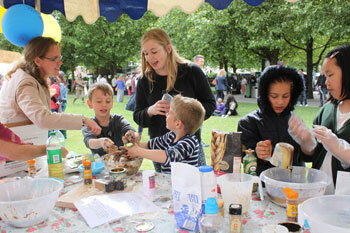 The artworkwas was created through a series of workshops based at the London Transport Museum themed around journeys. 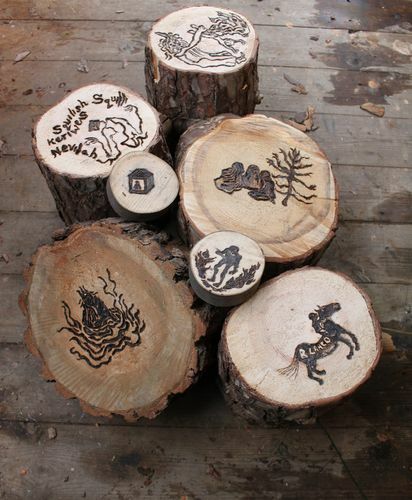 Calligraphy and zoomorphic imagery was used to create the final work. A site-specific intervention based on the idea of lost gods, and the library as a place that links the present to other worlds. Created in response to a brief set byRednile projects, who were looking to commission site-responsive works for the Literary and Philosophical Society in Newcastle, UK. 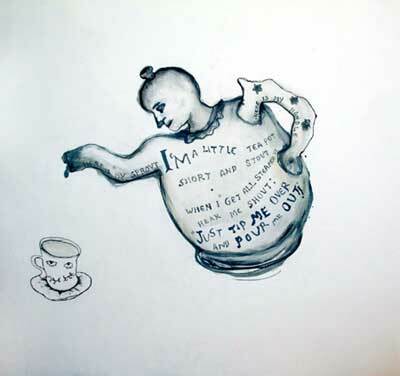 Drawings inspired by nursery rhymes for the wall, columns and plinths of the Saison poetry library, Royal Festival Hall, commissioned by the South Bank Centre, 2010. Wanted is an art trail consisting of drawings and words disguised as adverts that convey thoughts and feelings about mental health issues as they are experienced and perceived, inspired by conversations with Creative Routes members. 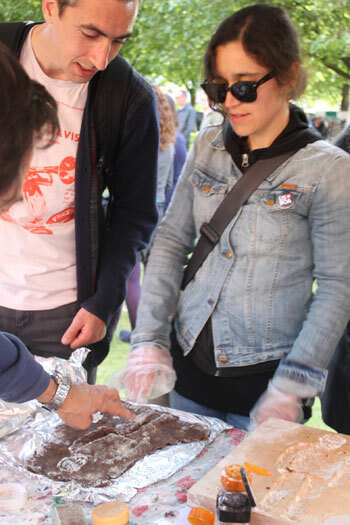 Creative Routes is an organisation based in South London, run by and for people who have experienced mental ill health. 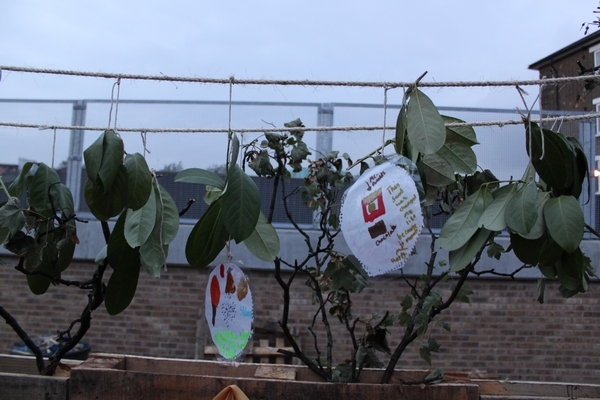 The project was commissioned by Creative Routes in collaboration with the South London Gallery for Bonkerfest, a festival that sets to open discussion about issues surrounding mental health through public art interventions. The drawings and text-pieces were created for the festival and exhibited in the classified ads section in nine newsagents' windows around Camberwell Green, as a public art intervention and a broken narrative. Through a random cluster of adverts offering services and goods, an unpredictable and honest narrative is created collaboratively, reflecting the hopes, needs and desires of an imagined local community. Wanted inserted a secondary narrative that sits alongside the normal adverts, communicating personal voices whose only desire is to express themselves and be acknowledged. This project is visually inspired by the direct language of the classified ads. Some of the drawings and text-based pieces sit between the gaps of other ads, interrupting the window display, while other pieces use the same visual language as real ads, and are in fact ads which have been collected and modified to include voices other than their own.